Sue has been involved as a volunteer with SAR since 1997. She has participated in multiple searches in WI, IL and MN over the years working as a dog handler, incident command, scribe, public information officer and scout. She did not become a dog handler until 2004 upon her retirement from Northwestern Mutual Insurance Company, where she was a compliance and underwriting officer. In addition to being a member of Wisconsin K9 SOS, she is also a member and secretary for the North American Search Dog Network, which includes members from the United States and Canada. Sue attends search seminars throughout the country on an annual basis to continue to grow in her knowledge of SAR. She attended classes on human 1st aid, K9 1st aid, crime scene and evidence preservation, blood borne pathogens, hazardous material handling, critical incident stress management, and strategic search management. 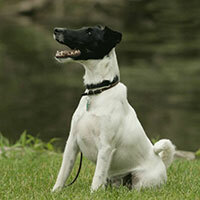 Spirit is a male Smooth Fox Terrier, born in 2008. He is a super friendly and high drive worker. He loves to play and working land and water cadaver is a great work ethic for him. Spirit would rather play than eat (although he does like to get treats-no matter what he is doing). He lives with a female Golden Retriever, Karma, that he considers to be his “Rabbit” as he loves to chase with her and play hide and seek with her. 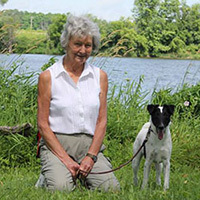 Spirit is working in the footsteps of my 1st search dog, Seeker, who was also a Smooth Fox Terrier. Seeker would be very proud of Spirit’s work ethic and abilities.